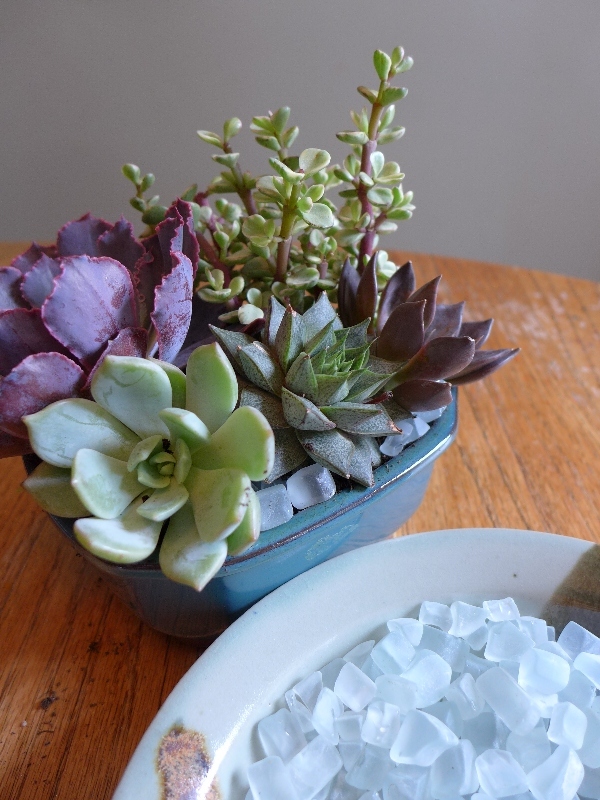 Gardening and designing with succulents has been extremely popular in recent years. Most specifically, with creating container gardens. It’s easy to see the appeal – succulents are low maintenance, require less water than conventional plantings and let’s face it, look fantastic! 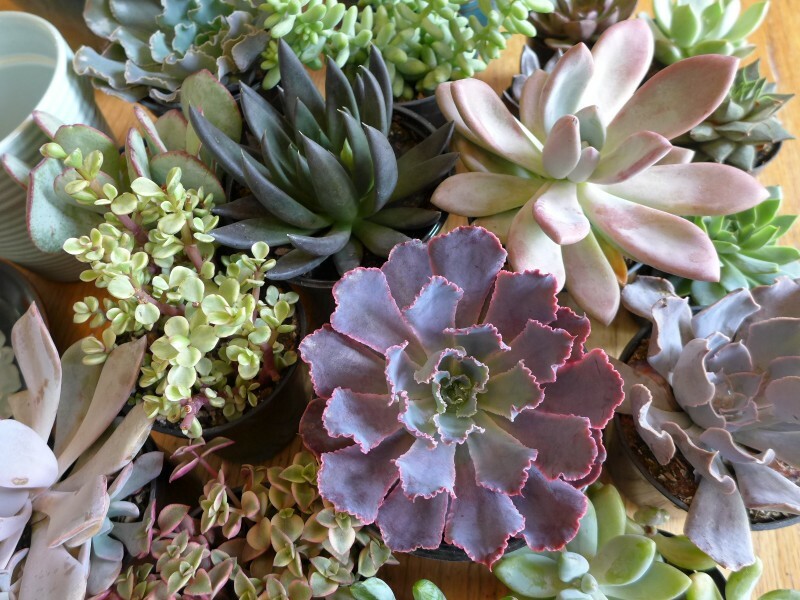 Succulents come in an amazing array of colors, sizes and shapes. From bulbous to spiky, their foliage has a simple almost architectural appeal. 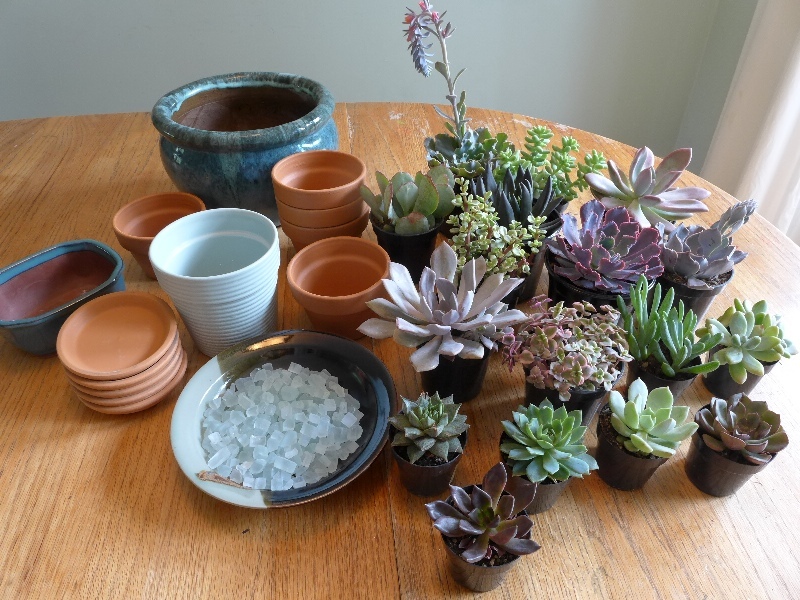 If you’ve followed my blog at all, you’ll know I have a little succulent fascination. 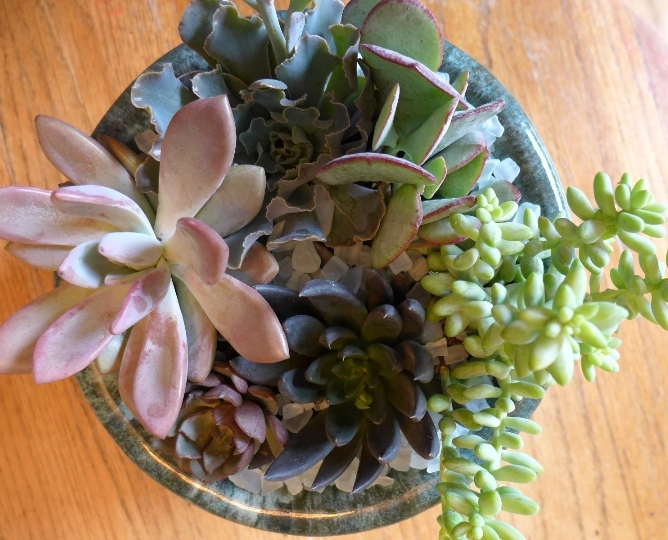 I thought I’d share an easy “how to” guide to designing and creating your own succulent container arrangement. 1.) Let an interesting succulent be the starting point for your design. It can be a exceptionally unique color or shape that attracts you, regardless, use it as the foundation for all other choices moving forward. 2. )Find an interesting container and let it be the inspiration for your design. 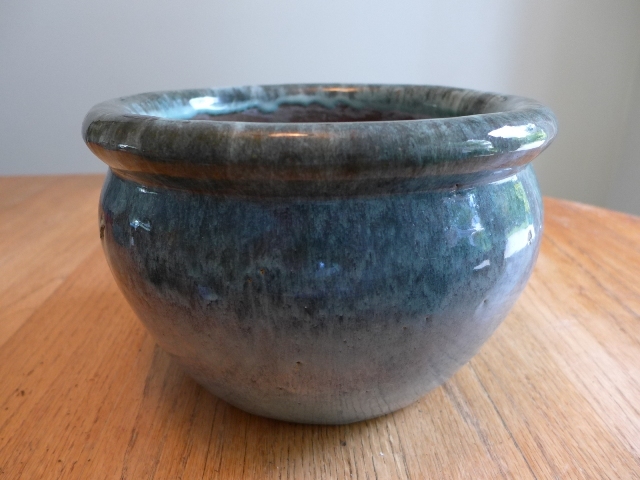 In this case, I decided to go with the muted aqua blue tones in this simple glazed pot. Your pot should have good drainage in the bottom – a hole at least a 1/4″ in diameter. 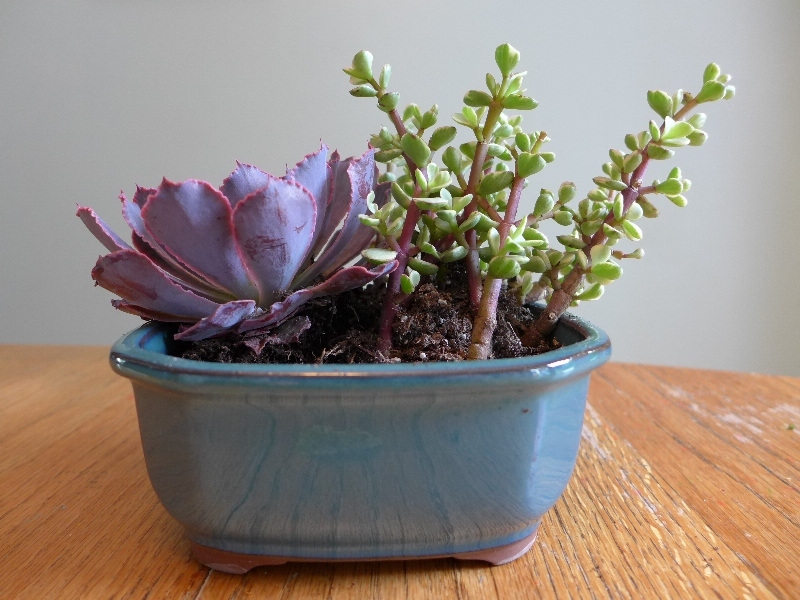 Keeping your pot choice in mind, purchase a selection of succulents that compliment it. You can go bold and choose analogous colors to your pot, or as I did, stick to colors close to those in the container. I chose dusty blues and purplish pinks. When selecting succulents, remember to check their plant tags to ensure they have similar water and care requirements. Next, cut a piece of mesh window screening, coffee filter or newspaper to place over the drain hole. This is to ensure water flows freely through the bottom of your container but you don’t loose soil in the process. 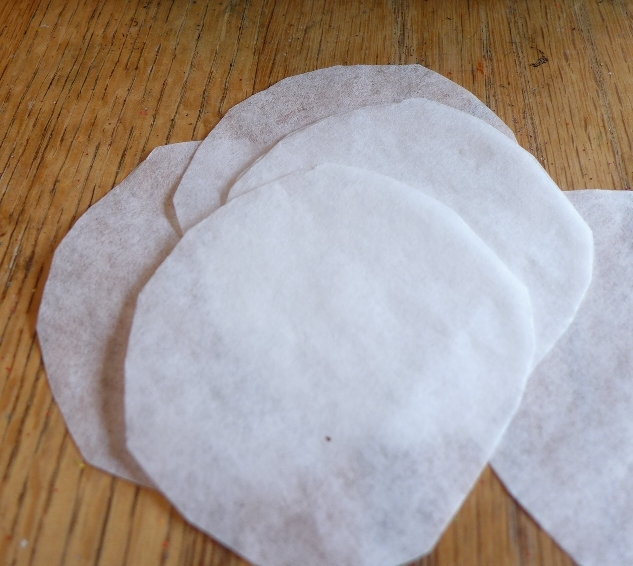 I didn’t have window screening on hand so I cut circles out of coffee filters. 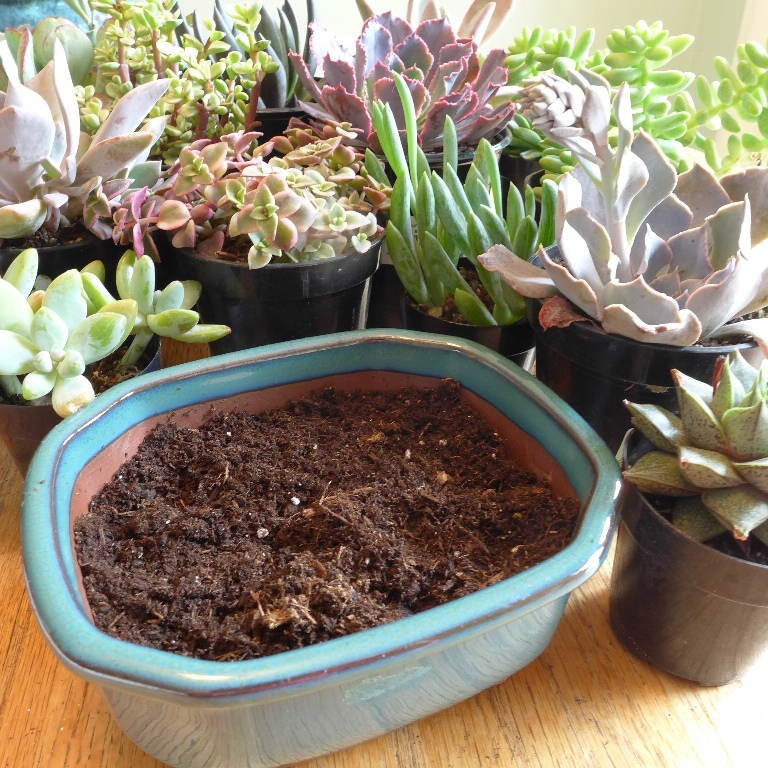 Fill your container approximately 3/4 full with soil. Pack it down slightly to reduce soil shrinkage once the plants are in. 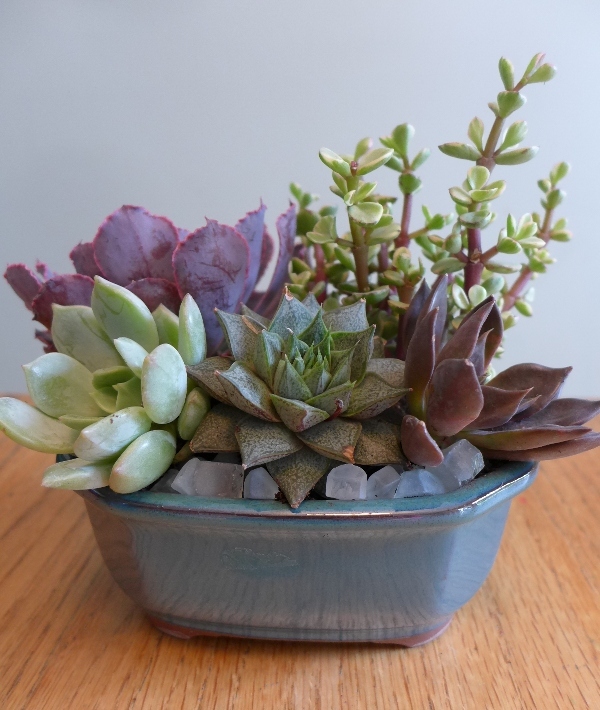 While keeping the succulents in their pots, set them in the container to get a sense for placement, plant orientation and combinations. If you’re lucky, you’ll have a inquisitive five year old on hand to help you with this part. Remove the plants from their pots and gently knock off excess soil. 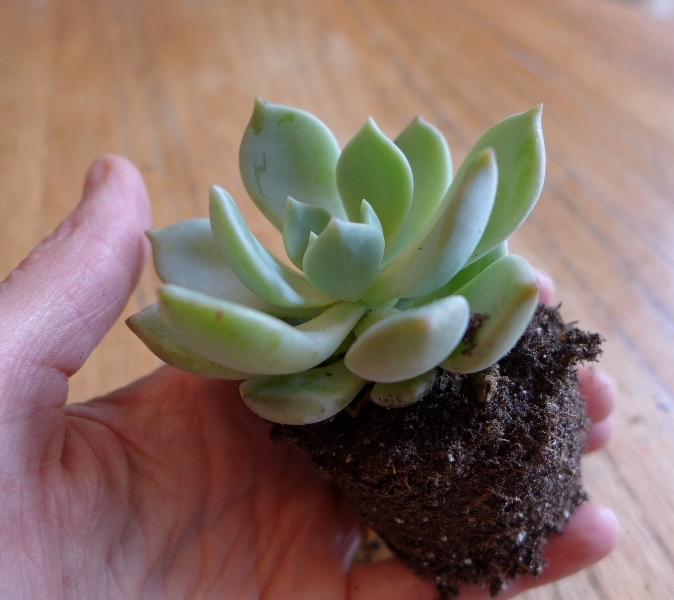 Before I plant my succulents I remove any dead or dying leaves from the base of the rosette. 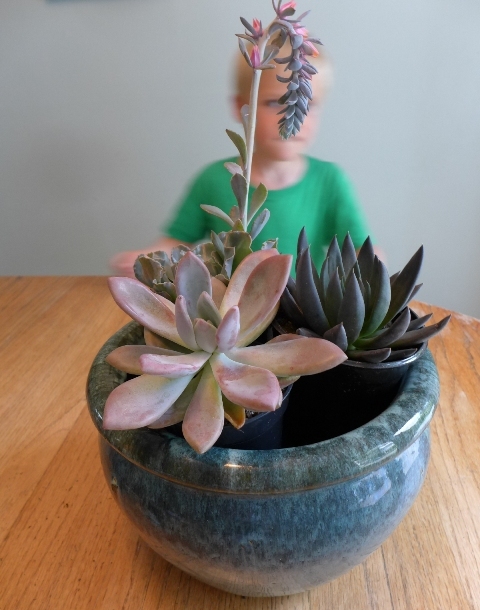 Succulents are delicate so it’s easy to accidentally knock the foliage off – handle them as carefully as possible to avoid this. This is why my husband was wondering why it was taking me so long. 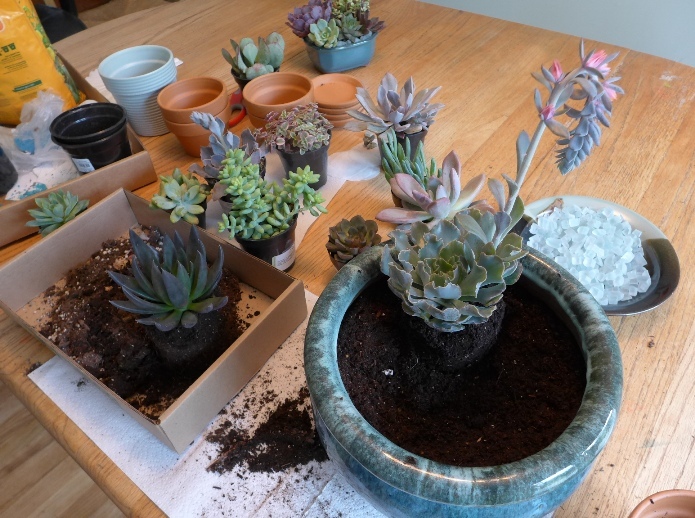 Tuck them snuggly into the pot approximately 3/4 of an inch to an inch below the surface so you have room for top dressing and to ensure that when you water it doesn’t instantly spill over the top lip of the pot. Bring the soil just to the base of the foliage and gently pack it in around the plant covering all the roots and reducing the potential for air pockets. Look for balance in your planting, mix up your textures -place bold next to fine, smooth next to pointy, etc. Place the taller plants in the back or center of the arrangement, depending on its’ orientation. Once you get then planted the way you want, you’ll most likely have soil in the foliage and on the edges of the pot. You can brush the leaves with a little whisk, or as I do, close my eyes and blow the soil off. Whatever works! It can be a messy process, but so fun! The last step is to add a top dressing. This isn’t necessary, but I find really finishes the container. It’s that detail that gives it a little extra “umph”. I chose cubed tumbled glass from Bedrock Industries in Seattle. You can order from them online, but if you’re local, be sure to go in and check them out. They have a greater selection available and you can buy in smaller quantities, if wanted. Another online resource is, buildingresource.org. Cover the exposed soil with the top dressing of your choice. A single container arrangement is extremely satisfying, but I find a small grouping adds an extra element of interest. Don’t be afraid to mix and match your containers. They can be varying sizes, shapes, textures and even colors. However, make sure there is at least one unifying element. In this case, the colors of the containers pick on the colors in the plants. In terms of care, find a spot for your arrangement that receives approximately 6 hours of sun a day. 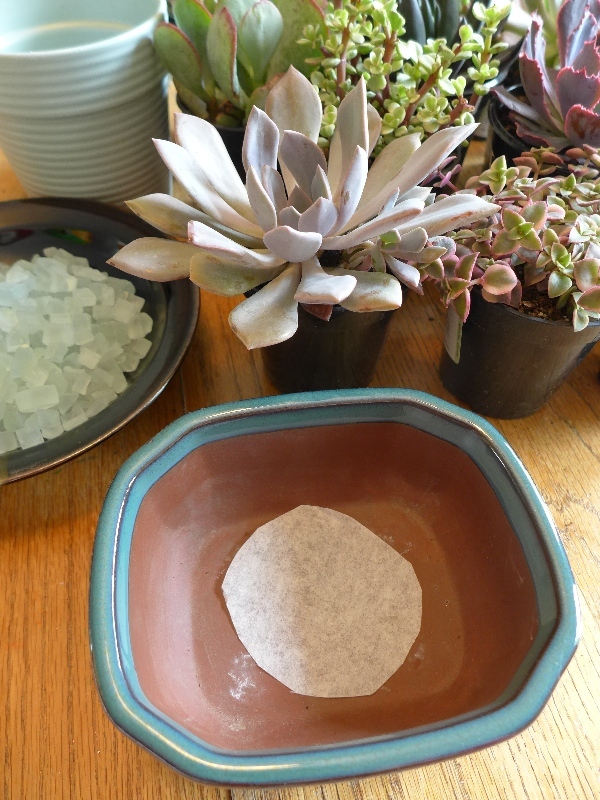 Most succulents need protection from the mid-day sun to prevent them from getting scorched. Indirect bright light is best. Keep the soil damp, but not wet during it’s growing season – spring and summer. Let the soil almost dry out, but not completely between waterings. In the winter water less frequently. 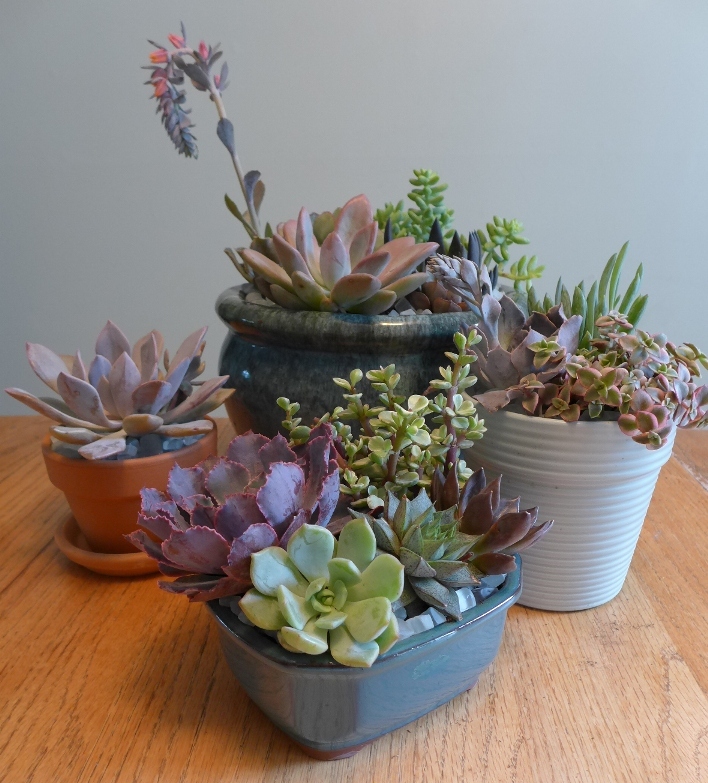 If you live in the Pacific Northwest or anywhere where it freezes, be sure to bring your succulent containers indoors during the cold months. 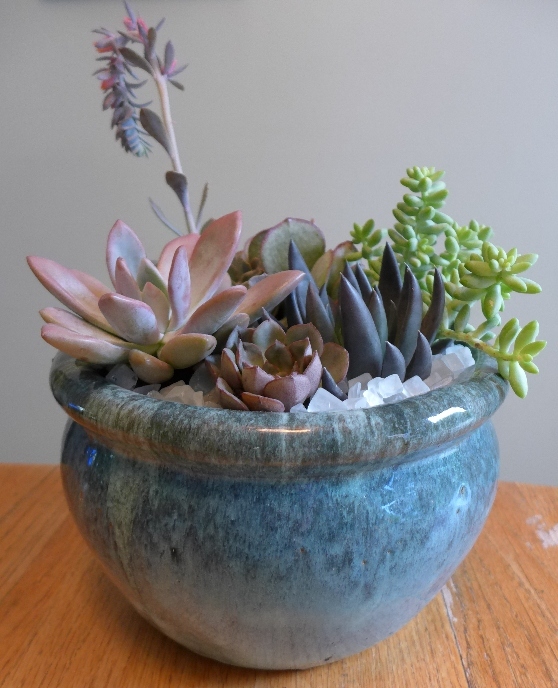 If you’re not up for creating your own succulent arrangements, let me know and I’d love to help. I love your succulent selections!